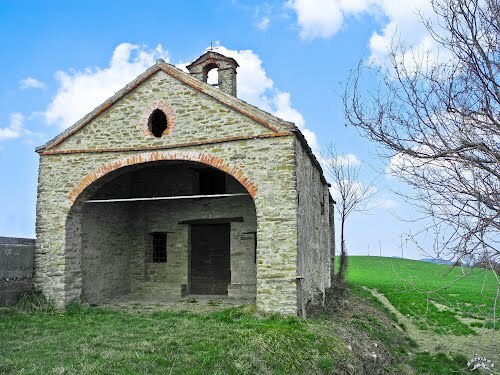 Mombarcaro – The church of san Rocco (the exact dedication is to the saints Rocco and Sebastiano) is an ancient church with a porch, built on the road from Mombarcaro to Niella Tanaro; it probably was used, since the Middle Ages, as a shelter for the pilgrims. During the many epidemics that took place in this region it was used as a lazaretto. Inside his church there’s a very rare fresco: inserted in a series painted in the XV century, it represents the “Ride of the Vices” – the only one present in the Langhe. It represents the seven mortal vices (pride, avarice, lust, envy, gluttony, rage, accidy) as characters riding different animals (a lion, a dog, a goat, a sheep, a pig, a wolf and a donkey); all chained to each other they ride towards Hell’s door. It probably was designed to be (and indeed it was) a kind of remainder for the pilgrims about the punishments for the sinners. 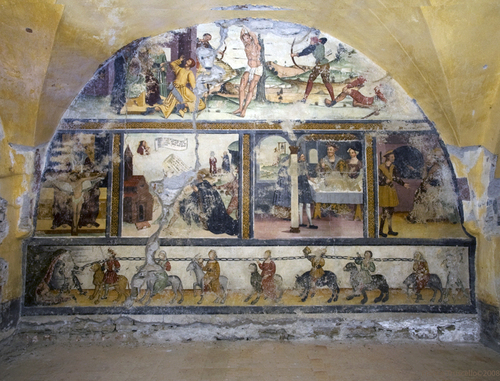 Other frescos (the temptations of saint Anthony the Abbot) are on the right side of the chapel, while the paintings of the two saints, Rocco and Sebastian, on the back wal, are not easy to see because quite damaged. A recent restoring has given the chapel back its dignity. To visit it, ask the parish. Mombarcaro, once called Monte delle Barche (Boats Mount), is the summit of the Langhe: from here you can get a great view, and also see the Ligurian Sea. Would you like to include the transport?